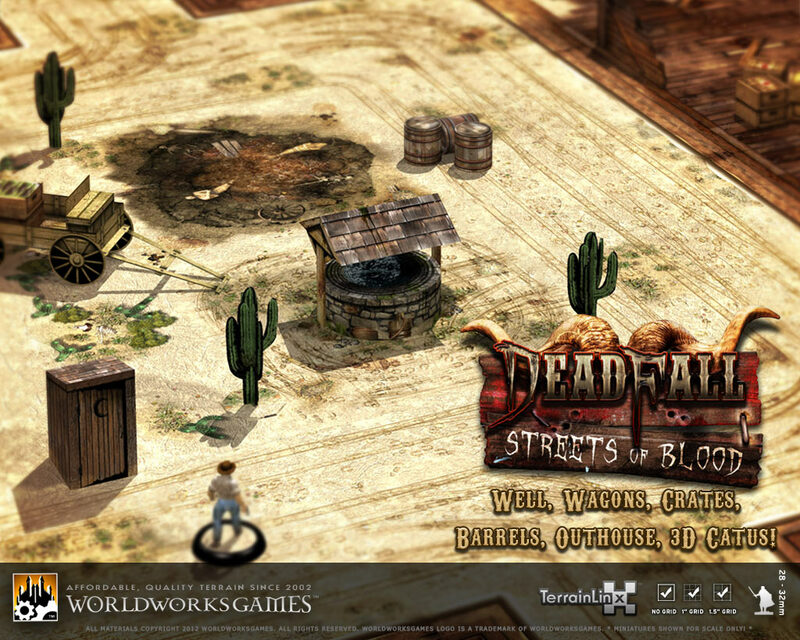 WorldWorksGames • View topic - ***RELEASED*** DeadFall: Streets of Blood Goes GOLD! 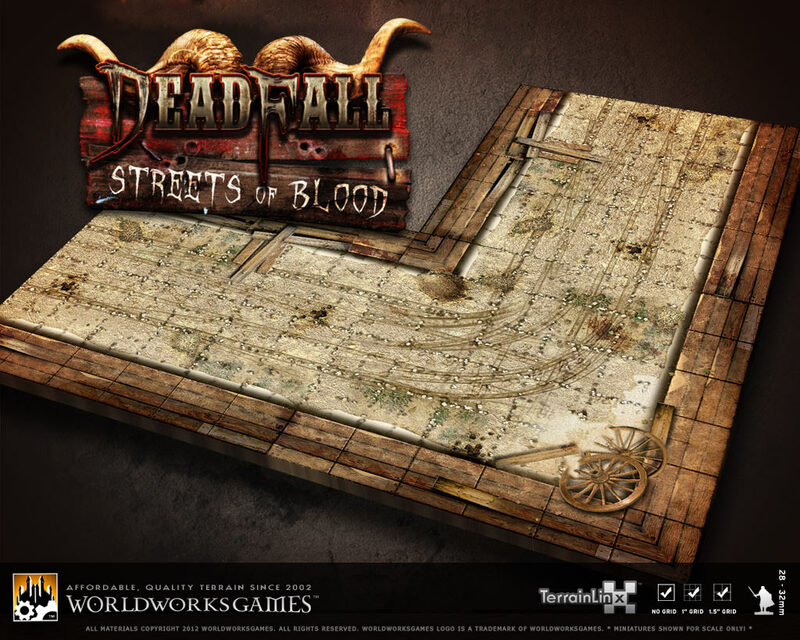 ***RELEASED*** DeadFall: Streets of Blood Goes GOLD! 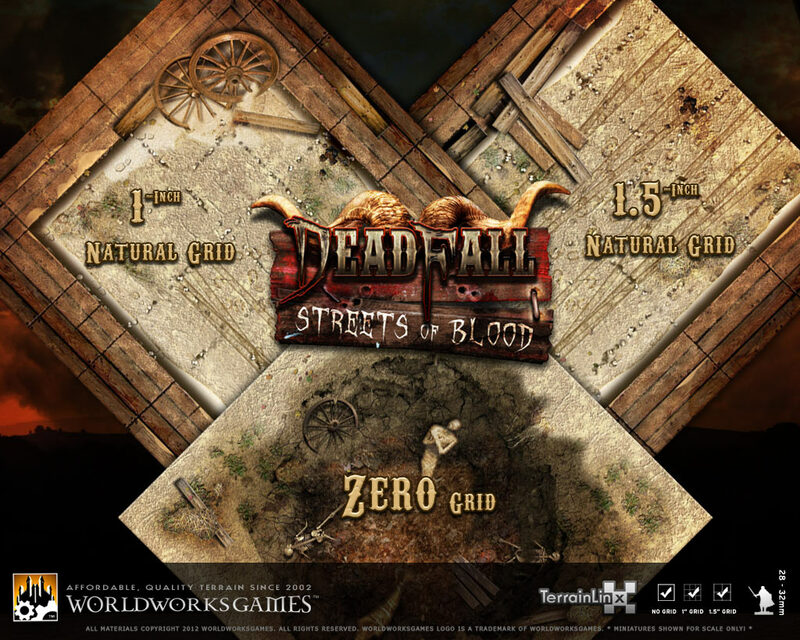 Post subject: ***RELEASED*** DeadFall: Streets of Blood Goes GOLD! The west was won in blood! 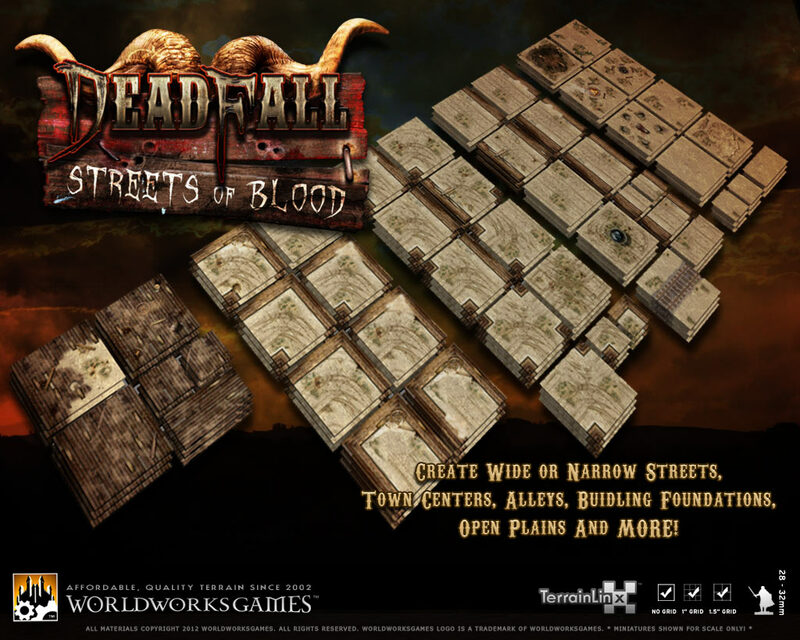 DeadFall: Streets of Blood is packed with over three dozen ground tiles and gives you everything you need to create an exciting gaming environment with a Western or Victorian theme! From abandoned towns, to vast desert plains dotted with cacti, humble campsites, mystic/occult intrigue and more! 7 6"x6" Wilderness Tiles in 1", 1.5" and Gridless formats (includes sacrificial circle, dumping grounds and camping tiles). And of course, full robo-cutter support and fully illustrated instructions to guide you through the building process. Awesome! I am looking forward to this set! It's about time I tackled a Wild West scenario... yeehaww! Oh my god this is so amazingly awesome. Look at the cacti! 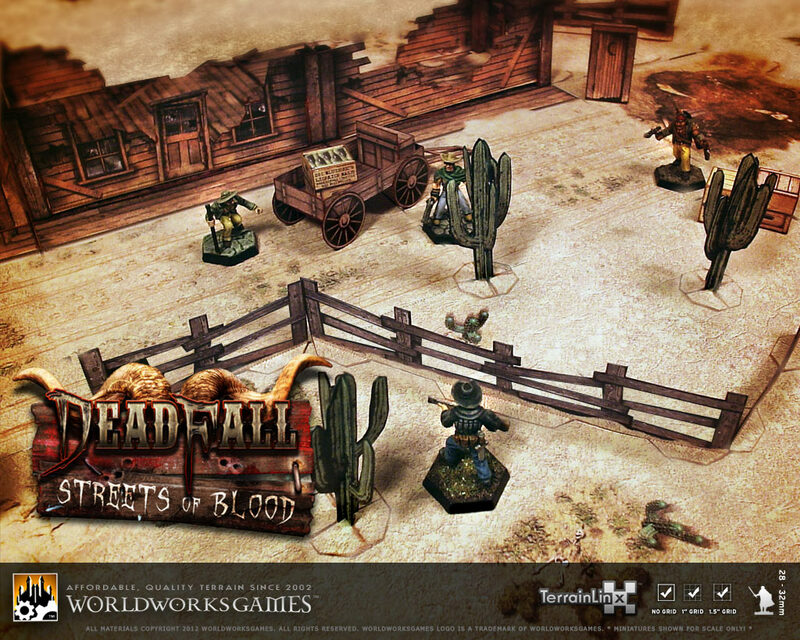 DeadFall Coral looking OK for that gunfight. Am I the only one that noticed this set includes Streets, and Ruins for the price 11.95? This set is a steal!!! Did I spot a railroad tile...? Yes, harleyfrank, that was a railroad tile - have to admit that I overlooked it on first glance. I recall they did say there was going to be a set for railroad stuff (shades of "Mayhem Rail"?!). Looks really good Denny & Matt... We're smiling, pardners! I can see players rolling for initative at high noon...very cool! Deadfall is one of the most inspiring sets I have interacted with. Can't wait to game on it. Damn! That looks so good! I'm far too busy making Mayhem City but that won't stop me buying this set.. and all subsequent DeadFall sets! It looks like a winner to me, Denny and Matt! I see the street set and the canyon set in the "In the Works" section. Is there no building set in the pipeline yet? Check out my webcomic, The Specialists! There's an entire pre-established arc for DeadFall offerings but we have to gauge it based on support as we move forward. If the support is there, we've got a really interesting way to roll out buildings to everyone. Disclaimer: I really don't like building TLX kits. However, I'm really quite excited to see the release of this set and I actually look forward to building the TLX goodness contained within. Some people see Old West, I see Fallout scenarios. I don't even play in a western based setting. I still want it. I don't know if or when I am going to use any of it. I am still buying it. Question... is this something we have to print out ourselves and we're buying a PDF file? or do we get the tiles and everything in a box? This is a TerrainLinx product, a print-it-yourself pdf download. Ok, any hint on release date please? Welcome to the forums! Hope to see some of your builds soon after this set drops. Hey Necros! Just to be 1000% clear; TerraClips http://www.worldworksgames.com/store/in ... ystem_id=2 is our only tangible/Retail, physical product line. 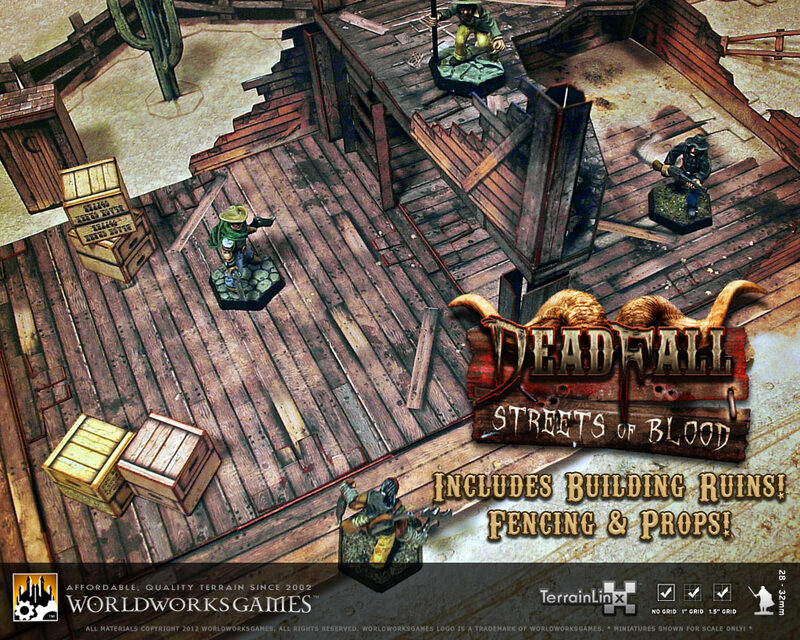 Everything else in our catalog including TerrainlinX http://www.worldworksgames.com/store/in ... ystem_id=1 is PDF "Print, Build, PLAY!" format. That might be confusing to a few folks who are new here. Anyway, be sure to read the descriptions of the above systems and click through on the links which will take you deeper into what each system does and how it all works. Soon is not a DATE. 1st April is a date, not soon, shortly etc. Man I hope so, she screams steampunk, Malifaux.